"This has to be one of the most beautiful belts I've ever owned. Beverly is fantastic and the speed in which she shipped my belt was impressive. I will buy from this wonderful lady again. All I can say is .....Thank you, I love it!" Annie Josefsen. 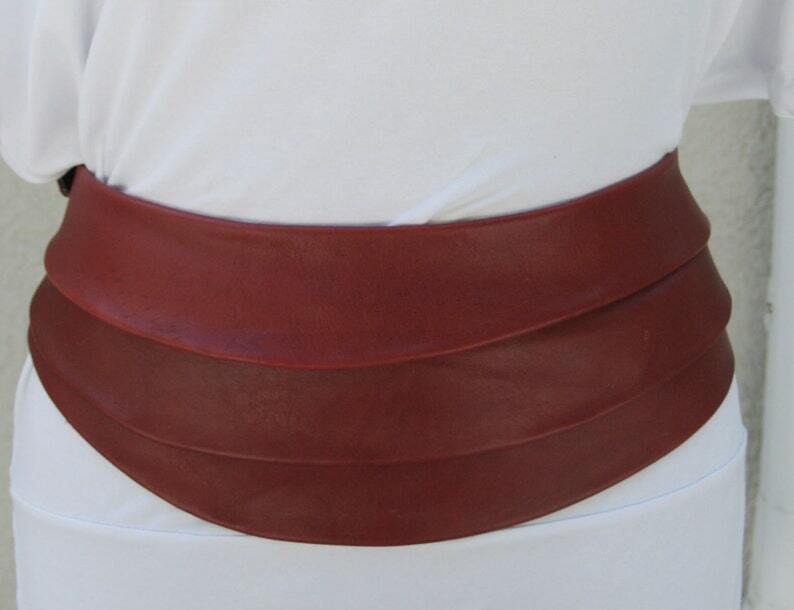 Beautiful rich deep red leather creates a wide cinched waist cumberbund belt. Truly one of a kind, the design is created to compliment and cinch in the waist. This lamb skin belt can go from day to evening without missing a beat. Tapers in the back and is adjustable to accommodate a waist from approximately 30" to 34" Sophisticated, fabulous and fashionable. Divinely inspired. I accept Paypal, credit cards and money orders. I will also reserve an item (layaway) for you for a deposit of 30% of the item. This deposit is non refundable fee. You will have 30 days from the date of the deposit to pay for the item in full. Please contact me if you are interested in reserving (layaway) an item.. Exceptional customer service and satisfaction are my priorities. If you are unhappy with your purchase, please contact me within 2 days of receipt. After contacting me, I simply request that all returns are mailed within 6 days after receipt of the item. Items should be in an unused condition and the Buyer pays all shipping costs. Custom items require a 50% down non-refundable deposit. Changes in custom order specifications have the potential to alter the final price. Once production of the item has started, no changes to the order can be made. Upon final purchase the item cannot be returned for credit or refund. Once the finished product is listed, it will be reserved for a maximum of 15 days, after 15 days the item will be sold and the deposit forfeited. I ship internationally, all duties and extra costs associated with shipping are the responsibility of the customer. Please contact me for a quote. Please note: All items are shipped with a tracking number which will be sent to the buyers. Once the item ships to the address on file with Etsy and a tracking number shows that the item has been delivered, the seller bears no responsibility for whether the buyer receives the package. For my US and Canadian customers, I ship all packages with tracking and if you'd like insurance just let me know. I'll ship your purchase insured and add the cost to your invoice. All of the items shown are designed and crafted by me, no two are exactly alike. That's the wonder and beauty of handmade, you're guaranteed a one of a kind piece. If you see something that you like and it's not in your size, contact me and I'll be delighted to design something comparable, just for you.